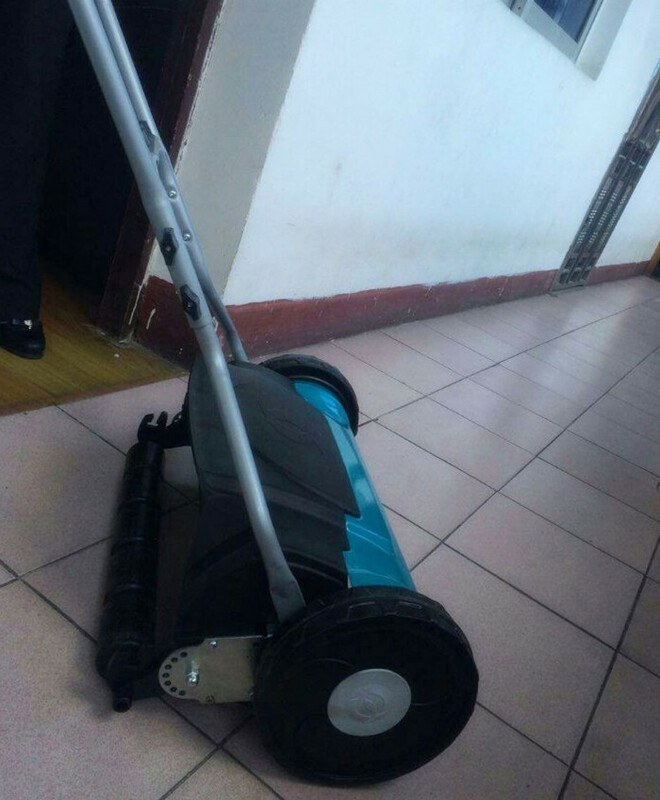 This hand push Lawn Mower is for cutting lawns only. 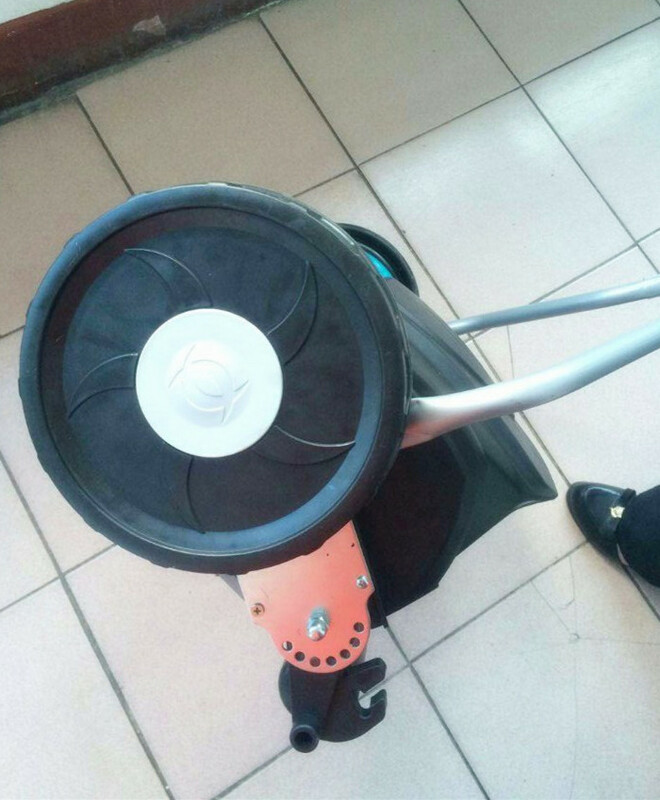 No petrol, no electricty, only push with your hand.It is low carbon and environmental friendly. More than tens of thousands of our lawn mowers have been exported to the United States since year 2008.It must not be used to trim hedges,bushes or shrubs,for cutting or pruning,or for any mowing where both wheels and the roller are not fully supporting the mower. Before beginning to mow,remove any foreign objects,such as stones,branches,or toys,from the area. Continue to check for such obstacles during mowing. The lawn should be relatively dry. Mowing wet grass cuases an uneven cut. Do not mow when it is raining. The grass box collets the clipping as it mows. The grass box attaches at the grass catcher hooks on the mower and by the strap to the lower handle,as seen below. Mow with the grass box using the same procedure as for normal mowing. Comparing with engine or gasoline mowers,hand reel mowers have more advantages.Small measure,lightweight and easy to maneuver,hand reel mowers do benefit to environment,which is the super advantage.No power and no fuel needed,all it takes to start a hand mower is a push. You push, it cuts,every time just as you like.No fuel means no pollutants.No noise pollution.Just the clean,quiet,precise cut that makes for a healthier and more attractive lawn.Hand reel mowers are simple mowers which are easy to maintain.Brush them off and spritz the blades with rust protecting oil occasionally.When you walk on your lawn pushing the hand reel mower easily,don't you feel happy? Our hand reel mowers are ideal for your lawns. 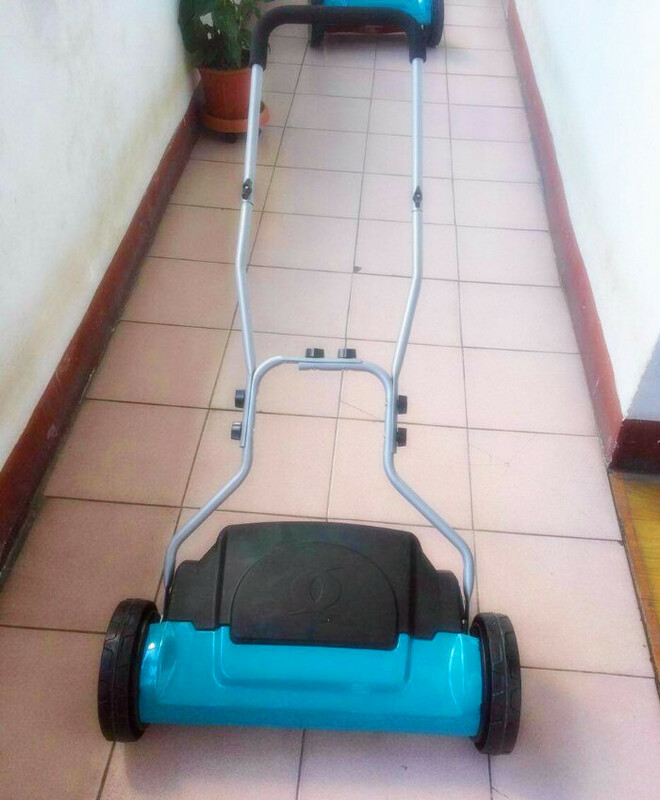 Use hand reel mowers,make your life more convenient.Our hand reel mowers have variety of designs,good quality and reasonable prices.We sincerely look forward to successful collaboration with you! Looking for ideal Hand Push Lawn Mower Manufacturer & supplier ? We have a wide selection at great prices to help you get creative. All the Manual Lawn Mower are quality guaranteed. We are China Origin Factory of Hand Push Grass Cutter. If you have any question, please feel free to contact us.